The front is on fire and the back is burning. Quite literally. Up in front, the country’s current Parliament session has gone up in smoke-logjam over GST, Land Bill and all. Down under, in the Prime Minister’s backyard, Gujaraj, a Patel ignited prairie fire – akin to the Gujjar reservation stir in Rajasthan – rages unhindered, threatening to engulf the government of his protégé, Anandiben Patel. If in Delhi, the PMO’s erroneous political assessment has united a disparate opposition and forced the BJP onto the road after a dud monsoon session, in Gujarat, brimming streets overflowing with agitated humans threaten to rip apart the caste constituency assiduously cultivated by the BJP to trounce the Congress over decades. The fallout may prove more detrimental to Narendra Modi than the Delhi election results. What goes round invariably comes round. Many a Parliament session floundered as the BJP-led NDA opposition played the bully and ballplayer rolled in one, during Manmohan Singh rule. It was Gujarat chief minister Narendra Modi’s no-holds barred opposition that thwarted the Congress-led UPA’s efforts to build unanimity on the GST Bill. The Land Bill, on which the Prime Minister staked his all, is well on its way to the bin, the GST hangs a limbo, the Rafale fighter plane deal with France, down from 126 to 36, still faces turbulence, while the Naga deal is a PMO hyped, bare-boned framework which has both home and defence ministries going transparency! While Prime Minister Modi is yelling bloody murder after being administered a taste of his own medicine in Delhi, albeit at national cost, there are storm clouds gathering in his citadel of Gujarat which has the potential to scar his successor’s government beyond retrieval and singe the Prime Minister in the bargain as well. 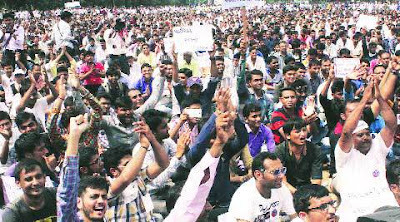 The demand for OBC quota by the Patidars (Patels), considered the most affluent and influential community in the state, was initially the brainchild of a section within the ruling party in Gujarat aimed, at best, at weakening the hold of chief minister Anandiben Patel, who enjoys the backing of Modi. With the elections to local self-government bodies, all the key municipal corporations as well as the panchayats and town municipalities, due later this year, the intention was to trigger some reverses which would put the Chief Minister on the back foot. The idea had the backing of some of the sidelined Patidar leaders as well as her detractors within her own set up. The movement, however, has boomeranged and spiraled precariously out of control. With 14 per cent population and 21 per cent voter representation, this by far the most affluent and influential community, has eight ministers, including the Chief Minister, and 42 out of the total 182 legislators in the state. It dominates all walks of Gujarati life be it trade, commerce and industry or professional, social and community ownership. Interestingly, the movement has grown roots at a time when the state government and the Gujarat BJP are both headed by a Patel-Anandiben and RC Fardu, respectively. The present movement is headed by a youth in his early twenties, Hardik Patel, who is the convener of the Patidar Anamat Andolan Samiti(PAAS), which is leading the stir. No one had heard his name when the stir began and now just the mention strikes a reverential awe amongst community members. All this happened in a matter of less than three months. Earlier, most BJP big-wigs within the government were indifferent and chose to ignore it, while the chief minister’s detractors chuckled with glee as the movement spread like a bushfire. Their mirth was short-lived as the community youth, all fire and brimstones, have taken complete charge of the movement, marginalising them totally. In fact, the rapidly spreading stir reminds one of Modi’s election campaign type blitzkrieg, for sheer management, marshalling of both resources and the social media as well as planning. Whatever may have been the fate of the BJP’s missed calls memberships registration campaign is best known to them, but the ‘give a missed call and register ’drive of PAAS has been a resounding success. On the other hand, official attempts to involve the cops to stem the stir have been fobbed off with warnings of swift and bloody reprisals and similar has been the reaction to involvement of ruling party politicians from the community in any effort at sabotage.”You and your homes will be taken apart by a sea of humanity”, they were told. The fact is that the Anandiben Patel government is totally at sea dealing with the stir. Attempts at involving ministers as via media has drawn derision while the efforts to draw in community religious or philanthropic personalities have also failed as have attempts to sow discord and engineer a split in their ranks. National BJP chief Amit Shah had to burn midnight oil when the Chief Minister with other key leaders in tow rushed down to Delhi in a bid to find a solution which, however continues to elude them. A seven member cabinet sub-committee has been formed in a desperate bid to deal with the reservation stir and though the leaders are inclined to talk, they have made it clear that they are in no mood to climb down. For all the importance to the solution search, there have been gaffes galore. Union minister of state for agriculture Mohan Kundaria, who visited the state in the first week of this month, only queered the pitch when he claimed that the Congress was fuelling the movement. Within hours PAAS released photographs of their leaders in the company of the BJP top brass in the state. “We have much more in store, don’t force our hand with such cheap tricks”, they hit back. The mood of the movement leaders buoyed by a sea of support from the community is determinedly aggressive. For the moment all eyes are set on a rally which is to be held at Ahmedabad on August 25 as a show of Patidar strength. The movement leaders have already made it clear that if their demands are not conceded, they will provide an ‘intent demonstrator’ in the ensuing civic polls. Interestingly, it is the non-resident Patidars, living abroad, UK, USA, Canada and the likes, who are emerging as the biggest supporters of the movement. According to Hardik, there are 525 pro-reservation WhatsApp groups, 130 Facebook pages and over 15 lakh members on the Google registration forum created to reach out to Patidars worldwide and keep them updated. Whatever the outcome of the stir, it has ominous portents for both Modi and his party. It will irretrievably damage the caste mosaic put together to form the Hindutva vote-bank. The BJP had sewn together disunited upper castes, Other Backward Castes(OBC), sheduled caste (SC) and scheduled tribes(ST), along with the Patels to carve out it’s hindutva vote bank. The OBCs, who outnumber the Patels, are strongly opposed to OBC status for them, and so are the SC and STs. In the post-agitation period, the BJP faces the danger of alienation of these castes. These castes have also gone into a huddle and the fear of the outbreak of a caste war in the coming days hangs heavy. It would auger well to turn the pages of Gujarat’s history. In March1985 Madhavsinh Solanki was re-elected with a majority record that still remains unbeaten. He bagged 149 of the total 182 seats in the Vidhan Sabha and yet his government lasted only a few months. An anti-reservation stir backed by the Patels triggered a chain of events that led to the fall of his government in July 1985, just four months later. History has an uncanny way of repeating itself, if you don’t learn your lessons well.